Create a class called Cylinder.java that contains two double-precision instance variables named radius and height. The class should include a constructor that initializes the radius and height variables. Also, you need a class method named volume() that returns the volume of a Cylinder object. The volume of a cylinder is given by its radius squared times its height times Pi (radius * radius * height * Math.PI). You can either use the value 3.1416 for Pi or use the Java provided value named Math.PI. Write a class called CylinderTest.java and declare an array of three Cylinder objects to call the methods you declared in the Cylinder class. Make sure that all class methods are called from main(). Have main() display the value returned by volume() and verify the returned value by hand calculations (paper/pencil). 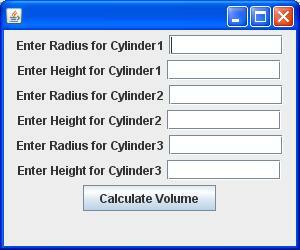 Prompt the user to enter the values for the radius and height of each Cylinder object in the array. 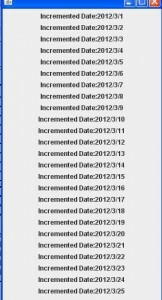 Create a program called Date.java to perform error-checking on the initial values, for instance: fields month, day, and year. Also, provide a method nextDay() to increment the day by one. The Date object should always remain in a consistent state. Day 31 invalid. Set to day 1. Day 32 invalid. Set to day 1. Hi i need to use JFrames on this lab. Are these screenshots of JFrames? Yes i have used JFrames for this lab. If you see the screenshot is of the JFrames. 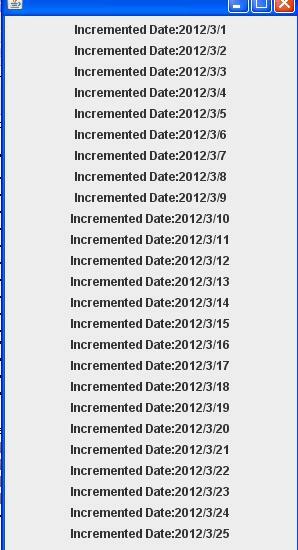 i cna see the date program snapshot. What happens on month end.